The Theatre Royal Haymarket is one of London's oldest playhouses, receiving its royal patent (to perform drama) more than 250 years ago. It is a grand and wonderful monument to the traditions of not just London, but world theatre, and entirely worthy of its 'royal' title. With a towering history of stage productions as intimidating as the Palladian colonnade that fronts the building, standards at the Theatre Royal Haymarket are extraordinarily high. Trevor Nunn took over as Artistic Director earlier this year and he is overseeing a series of productions befitting the venue. 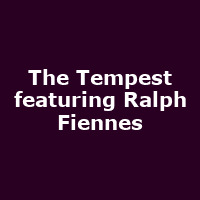 In late August, the third production of his tenure sees BAFTA-winning, Oscar-nominated Ralph Fiennes leading the cast in Shakespeare's The Tempest. The Tempest is set on a remote island where Prospero, the exiled Duke of Milan, had been left to die. Prospero conjures up a storm to attract his brother Antonio and his co-conspirator the King of Naples to the island in a scheme to restore Prospero's daughter, Miranda, to her rightful place. Taking on the role of Prospero, in what was most likely Shakespeare's final play, at one of the world's finest theatres will require the kind of intensity and presence Fiennes showed in his award-winning turn as Nazi war criminal Amon Göth in Schindler's List. Flashbacks to Göth taking random pot-shots at children over breakfast suggest that Prospero is in safe hands. Widely considered one of Shakespeare's greatest works, The Tempest will be at the Theatre Royal Haymarket from Saturday 27th August to 29th October 2011. Tickets range from £11/ £20 for gallery benches, up to £90 for premium seats and stalls.